Empire Paintball is the worldwide leader in the manufacturing and distribution of paintball sporting goods. Dedicated to quality, craftsmanship, and customer service, Empire Paintball embodies the sport of Paintball. Life, Function, Style. This defines Empire Paintball. Empire Paintballs There are 2 products. The RPS name/formulation has a long and deep history in paintball. For 30 years the RPS Advanced Formula has been refined to provide the most consistent paintballs in the market year after year. RPS Advanced formulas were the first to be specifically engineered based on playing style. Marballizer, Evil, and Bright Glow fill were the first paintballs and fill created specifically for competitive paintball play. Today Empire and the RPS Advanced Formula continue to build on our rich heritage and advance paintball worldwide. The RPS Advanced Formula continues to be recognized as the most consistent high quality paintball as well as the winningest paintball in tournament paintball history. With billions of RPS Advanced Formula paintballs shot every year, RPS is the most shot, most feared paintball in the world. Shoot the Best! 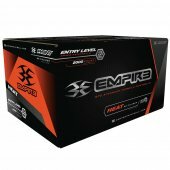 Shoot Empire RPS Advanced Formula!